I got a lot of positive response from my 20 Classroom Management Strategies You Can Use Right Away and Chatty Class Classroom Management Strategies and How to Help Gifted Kids posts where I compiled a lot of behavior management ideas so I figured I’d write some to show tricks for other topics like reading, writing, math, technology, parents, organization, centers, classroom set up, time management, and a whole lot more – I have a lot of posts planned and I’m really excited to share them with you all so make sure you check back often! I have included some affiliate links (I get a commission for purchases made through the links) in this post so you can easily find some of the things I show. I don’t care whether or not you buy anything – feel free to just idea scavenge if you want :) I just wanted to make it easy for you to find them! Okay so first trick! You’ve probably seen in a lot of my literacy posts that I LOVE highlighting - a trick I love to use is labeling the highlighter! Whatever you want them to highlight, simply write it on a white label and stick it on the highlighter. So easy!! 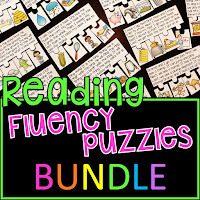 For this activity, I just used one of my Short Vowels Reading Comprehension Passages to practice parts of speech (nouns, verbs, and adjectives). My favorite highlighters are these chunky ones and you can use any rectangular labels like these rectangular self adhesive labels to stick on them and write what you want kids to highlight. You can also have them highlight a specific phonics sound in a passage. You can also label each highlighter a different sight word for them to highlight when they come across it. Would you judge me if I told you I had a whole drawer of highlighters labeled with each sight word? :) It’s really visual for kids so I like this trick. 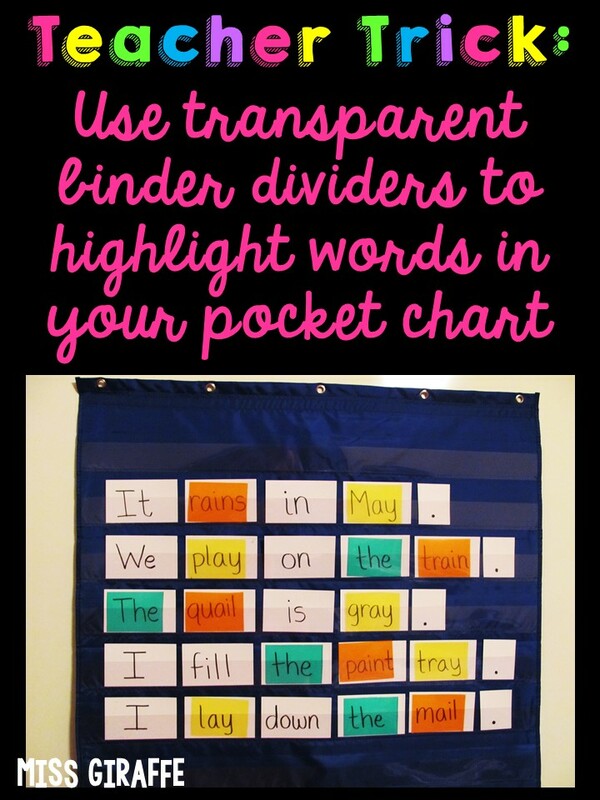 Speaking of highlighting, have you ever thought of highlighting words IN your pocket chart? 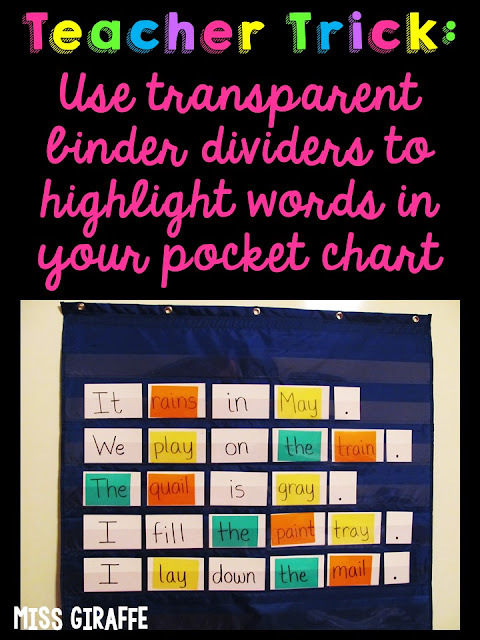 Simply cut up transparent color binder dividers the size of a word and use them to highlight words on your pocket chart! All you do is get transparent color binder dividers, cut off the tab and a straight line to cut off the 3 hole punches, and then cut what’s left into 8 equal size pieces. I fold it in half the long way, unfold, and cut along the line to get 2 strips. Then I fold the strips in half and cut to get 4 and then again to get 8 pieces total. They’re perfect for any literacy work in your pocket chart! As you can see here, we’re working on AI and AY so we’re highlighting AY words in yellow, AI words in orange, and then also highlighting the sight word THE in blue when we see it. 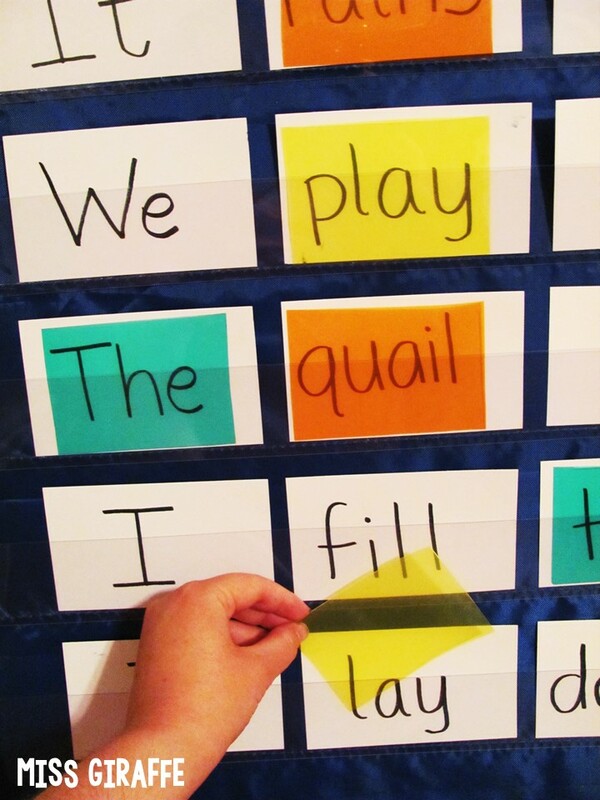 You can do it for phonics sounds, highlighting sight words, parts of speech, or anything you want to sort. You can do it whole group or even have students do it as a center. I know I’ve raved about my magnetic pocket chart before but I just love it! 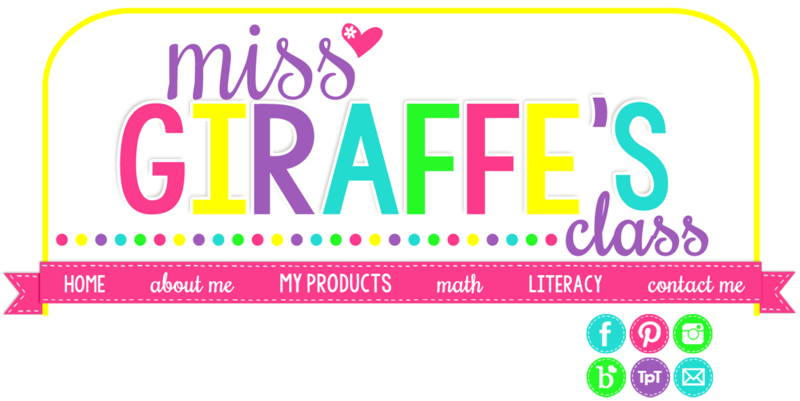 It’s perfect for my daily graphing question (read my Graphing post if you want to see that) as well as a ton of math and literacy activities including the one above. For highlighting words, I just use index cards or basic sentence strips in the pocket chart then use the cut up dividers to highlight any sight words, parts of speech, words with the focus phonics sound, etc. 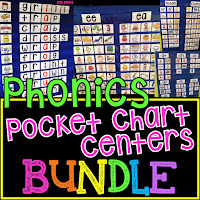 What I use my pocket chart most for is my Phonics Pocket Chart Centers – I have them for the entire year of phonics sounds so they’re a weekly staple. I showed a lot of ways to use them in my Short A post, Digraphs post, EW UE UI post, etc. so you’ve probably seen them a lot but I wanted to show you another way to use them using DOLLAR STORE mini trash cans! Are these trash cans not the cutest? And I got them for only a dollar each! I’ve shown you them before but I had to again because I am obsessed with these removable dry erase labels I stuck on them. Why am I obsessed? DRY ERASE. I can literally write any phonics sound on them and then wipe it off and make it a new one the next week. They’re also removable so you can just peel them off if you want to put them somewhere else. I use these on everything because they’re just so easy to write/wipe or peel off if I don’t want them on something anymore. They’re great for labeling buckets, centers, cubbies, etc. especially if you have students moving a lot, use a wet erase marker to label their cubbies with these instead so you can switch names easily. Kids love using dry erase markers too so I try to let that happen whenever possible. A teacher trick I LOVE is to put worksheets in heavy duty sheet protectors in a binder then let kids use dry erase markers to do the worksheets. It just makes it seem ten times more fun for some reason. This is actually out of one of my Phonics Sound Binders which I plan on writing a post all about them soon to show how I have a binder for each phonics sound that kids can grab and work on that particular phonics sound. This is the Long i binder. All they need is the binder and a dry erase marker. 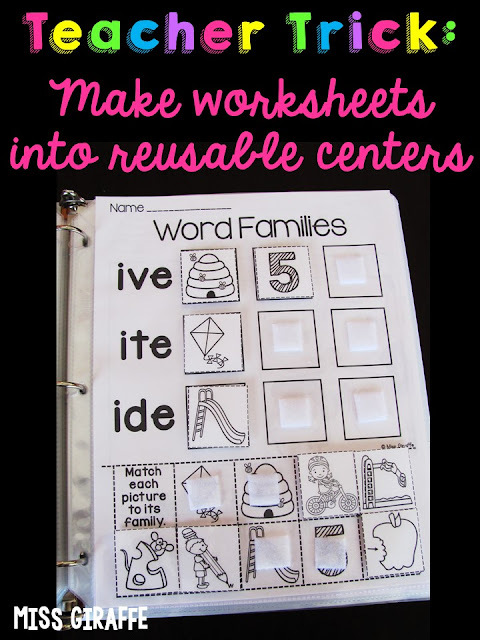 I also plan on showing you this teacher trick in that post but here’s a sneak peek – use this tape to create reusable centers in your binder from regular worksheets instead of having to deal with scissors and glue. You definitely need heavy duty sheet protectors for this, not just regular ones, or they may rip when kids pull off the pieces. 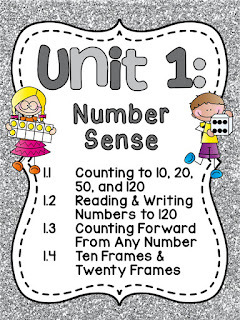 I also showed how I do this for math in my Fact Fluency post. Both those worksheets are from my Long I No Prep pack – I have them for almost every phonics sound. If you go to my Literacy page, you can see all the sounds I have them for. I show a lot of the fun activities from them in the digraphs and other literacy posts I mentioned earlier. 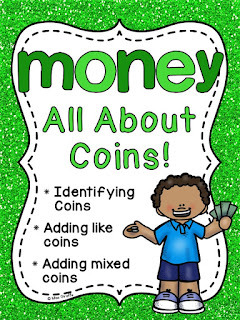 I love fun hands on worksheets but I also love to do a lot of hands on centers which I think is a teach trick in and of itself :) Prefixes aren’t a lot of fun by nature but they can be if you have a lot of visuals and games. Check out my prefixes and suffixes post for examples of what I mean! You can also switch up activities you already have by using them in different ways. If you read my CVC Bottle Cap Word Building post, you saw how I use recycled bottle caps for differentiated word building phonics centers. Well I also use them for a small groups game! All you need are the Bottle Cap Center word cards for whatever phonics sound you’re working on and some red/yellow counters. Print out the version that has ALL the letters in the circles (none missing) and cover up as many as you want with counters. You could do just beginning sounds, just vowel sounds, just ending sounds, all the sounds, whatever! Have the student put their finger on the counter and say the sound it is then slide it off to check. If they’re correct, they get to keep the chip. If not, it just goes back in the pile. Whoever has the most chips at the end of the game wins (or it can just be fun collecting chips)! This can be a really fun game to play in small groups, especially for struggling students, and it’s so easily differentiated by how many/which letters you cover. Like I said, I have these cards for just about every phonics sound so you can play the game all year. It’s also a great game or activity to have parent volunteers do with struggling kids because it’s easy and fun. Another helpful trick for struggling students is using a storage bag with a slider to practice ABC order. Simply use a permanent marker to write the alphabet across a bag then give it to students with their worksheet. Teach them to start at the first letter (A) to see if any words start with A. If they find one, they write it down; if not, they slide to the B and check for words that start with B and so on. It’s really helpful for students who struggle with putting words in ABC order. That sheet is out of my Long A No Prep pack – there are ABC order sheets in all of them, though, so you can practice it weekly with each phonics sound. It’s one of those skills that most kids usually get but need to practice often to keep fresh so I like to practice it every week with the new phonics sound(s). Okay so one of my FAVORITE tricks is a genius idea I saw from Sweet Sounds of Kindergarten that helps A TON with the frustration and mess of rough drafts and copy them into final drafts. Behold…. the clipbord stand! Take any clipboard and turn it into a stand! Seriously classroom changing. They can just clip their rough draft onto it and have it right in front of them to copy into a final draft so they’re not shuffling papers. AND… it doesn’t get lost. An edited rough draft that gets lost is even more devastating than a lost glue stick cap (the horror! ), am I right?! All you do is buy an 8 x 10 picture frame (go to the dollar store or clearance sections to find them cheap) and take the back out of it and adhere it to the back of a clipboard and it’s done! I actually just doubled up strong tape to adhere mine but you could probably hot glue gun it or something if you wanted. It is seriously the best! I have no prep writing crafts for a ton of different themes, holidays, and writing genres that I like to do each week. They’re quick and easy to make and they make really cute bulletin boards so I usually like to do a rough draft first so this is perfect for that. If you want to check out the writing crafts I do, I have a post for most months showing that month’s crafts :) Just click on the month you want: January, February, March, April, October, November, or December. I also use clipboard stands to display center directions! The centers in my first grade math units have directions so I just clip them onto the clipboard stand to easily make any desk an independent center! This game is Race to Graph from Unit 16: Graphing and Data Analysis which you can see the other activities in action on my Graphing post about that unit. 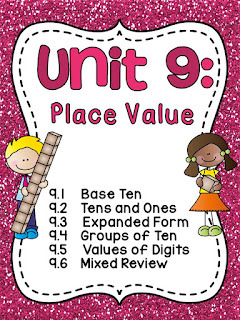 It has a lot of other pictures and ideas – if you go to my MATH page, I actually have a lot of different math posts by concept (place value, adding 3 numbers, etc.) that you can click on from that page. Another handwriting trick is to use a highlighter to create instant tracing worksheets. If you have a kid who struggles with handwriting or even just a certain letter, you can just write in highlighter and have them trace it with a pencil. You can also just create instant worksheets at your small groups table to practice sight words, spelling words, whatever! It’s nice because you can really tailor it to them without even using a computer. One more trick for this post! File your books to read aloud by month! I just get a little magazine holder type bin (like the ones on top of my rainbow drawers) for each month and put my special books for reading aloud in it. It makes it so easy to pull books to read or to quickly fill your display bookshelf if you have one each month. For example, spread out your classroom management books between your August and September bins, your Halloween books in the October bin, etc. Thank you so much for sharing your wonderful and inspiring ideas. I look forward to trying them out in class. You are so very welcome! I hope they work well for you - thank you so much for taking the time to leave me a sweet message! Thank you for these great ideas. I will be sure to try them out when school starts back. Thank you so much for your kind comment and for reading my blog! where did you get the trash cans? love them! I would like to get your sight word cards that have the short sentences. They look like task cards. I love them. How can I get them?